Home about Anonymous Adsense Alternative amazon android anonymous deep web Facebook creators fact hacking hacking computer kali linux under web website How To Install All Kali Linux Tools On any linux? How To Install All Kali Linux Tools On any linux? Many Linux users are willing to use the tools of Kali Linux but they don’t want to install another Linux distro for this purpose. 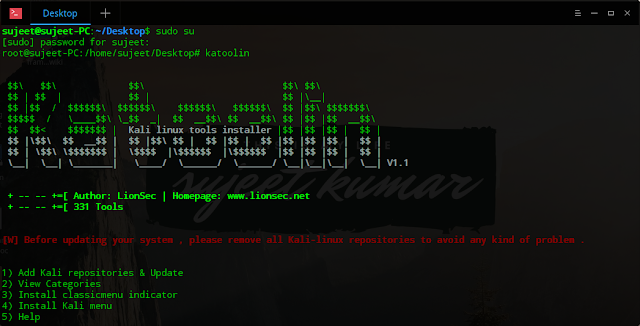 To solve this issue, you can use Katoolin script and install all Kali Linux tools on Ubuntu and other Debian derivatives. Kali Linux is one of the most popular Linux-based distributions being used by ethical hackers. This Debian-derived Linux derivative is specially crafted for penetration testing and digital forensics. However, if you want to use a Linux distribution for daily use, it’s not recommended. Using few simple commands, we can easily install Kali Linux tools on our linux machine. As soon as you enter this command, the following easy-to-navigate menu will appear with 5 options to add Kali Linux repos and update, categories etc. Now, you need to go back to the main menu and install Kali Linux tools in linux. To do so, simply type back and press enter. To choose a category of Kali Linux tool, yo need to select option 2 and press enter. 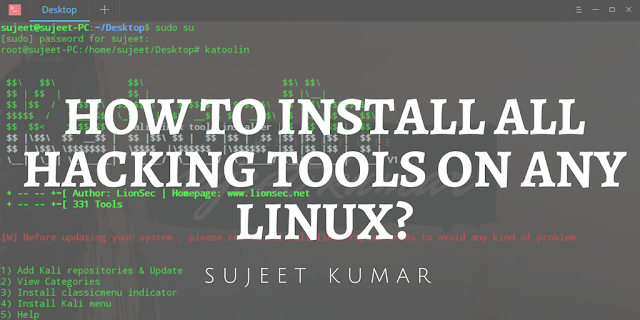 This way you can choose to install Kali Linux tools on linux and start hacking. Did you find this tutorial helpful? Share your views in the comments below.